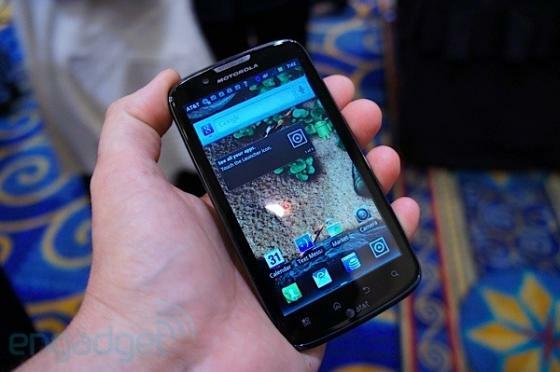 The Motorola Atrix 2 has been officially launched at the CTIA Conference, but it’s not quite as big a deal as you’d think. The original Atrix was the star of 2011’s CES as it could morph into a laptop through Motorola’s new Lapdock accessory. In addition, the Atrix was itself a beast of a phone, being one of the first to be powered by NVIDIA’a Tegra2 dual-core processor. You’d think, then, that anything calling itself Atrix 2 would be an even bigger beast of a phone. I recently reviewed the original Motorola Atrix, and actually rather liked it, so let’s see where the differences between it and the new Atrix 2 lie. Where the original Atrix used the Tegra2, the new Atrix 2 is powered by the TI OMAP 4, a 1GHz dual-core chip. This is something of a surprise, as you’d expect a significant increase in processor power, rather than just swapping one 1GHz dual-core processor for another. Other differences are more noticeable, though again not as revolutionary as you’d hope. The camera has been uprated from 5 megapixels to 8, the screen is much better, offering 960 x 540 qHD resolution and being much sharper than the original Atrix’s as it ditches the latter’s PenTile technology. The new Atrix 2 also boasts much faster data transfer speeds, offering 21Mbps over the original’s 14Mbps. Taking everything into account, the new Atrix 2 is very certainly an improvement, and is now capable of fighting the competition on many new levels. It’s just not the revolution we were hoping for – more an evolution. Indeed, in this light, it’s only natural that it’s an evolution, as the original Atrix was only released in February, so it’s a bit much to expect another revolution from its successor. For this, I blame Motorola for calling the Atrix 2. What it clearly should have called the Atrix 2 is the Atrix S, as S seems to be the term in favour at the moment for denoting an updated phone. The iPhone 4S, Sony Ericsson Xperia Arc S, HTC Desire S – all are incremental improvements over their predecessors. Still, that aside, the Atrix 2 looks to have filled in any gaps the original Atrix might have had, and with its Lapdock attachment, offers something that other phones on the market simply can’t match. It should, therefore, sell extremely well, which I’m sure will make new owner Google very happy!